A special creative writing set for all budding authors. 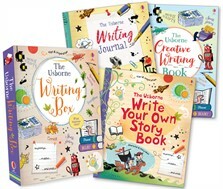 The writing box contains The Usborne Creative Writing Book, The Usborne Write Your Own Story Book and an 80-page writing journal with tips and space to write ideas. Ideal for helping young writers to create characters, decide on settings, and experiment with different forms and genres of writing.